Leeds United's Gaetano Berardi injures his hamstring against Ipswich Town. The Leeds United injury situation is ridiculous. Time will tell if they can cope with it – but it’s just bizarre. Leeds United's Luke Ayling picks up an injury against Nottingham Forest. You look at the knee injury that Liam Cooper picked up in last weekend’s 1-0 win at Sheffield United and it was so innocuous. Football is obviously a contact sport and there is obviously a potluck element of how injuries can happen. Some of the injuries look worse than others and the ones that happened in the training to Patrick Bamford and the Under-23s to Jamal Blackman, are the ones that will probably grate a little bit more. But the rest are just things that happen during the course of a game. We have looked at how hard head coach Marcelo Bielsa was training the squad and if that would take its toll, but these types of injuries can’t all be on the back of the training. I’m at a loss for words with it all, as it’s just bizarre. You see Cooper coming off and you are thinking ‘that doesn’t look too clever’, but then you get something you weren’t even thinking with Stuart Dallas fracturing his foot. I just wonder if even Marcelo Bielsa has ever come across this in his career and it will certainly be a test for him because it is so out of the blue. There is that element of it just being very, very unfortunate and we are talking about it from a team point of view. But it’s also unfortunate from a players’ point of view in that they are not able to be involved at such a wonderful time for the club. But if you are looking at it from a positive point of view, Leeds could have a whole raft of what feels like ‘new’ players come late January/February time and that might bring them together for what would hopefully be a promotion push. 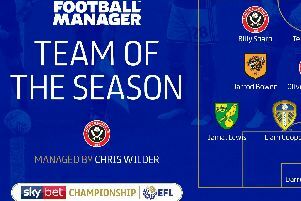 Here is the EFL Championship Team of the Year in full - which Leeds United players made the cut? But it’s just a real test of everyone involved and not only the actual players that are getting thrown in and getting through Christmas which we know is a very busy period, but also the medical staff. There’s only a certain number of hands that are there to deal with the walking wounded. As much as we talk about Christmas being a hectic time for players, it’s a hell of a busy time for the staff that don’t actually get stripped off but are just as vital in keeping everything ticking along. The 20-year-old Finnish defender Aapo Halme came on for Cooper at Bramall Lane and he almost scored. He looked fine, though from memory he wasn’t particularly tested but then that was just the way the game unfolded. He’s got big shoes to fill in respect of what Cooper brings to the team with his leadership abilities and the fact that he has been playing well. That’s the first question, can Halme fill the void left by the man he is replacing? And then after that it’s up to the players around him who have got a responsibility to make him feel as comfortable and confident as possible so that he can perform. You can look at someone like Kalvin Phillips and how he has managed to play, adapt and mature over the course of the season and that’s a great example of how to exert yourself in the Leeds team. Halme will be looking to people like Phillips for that little bit of guidance and showing him the ropes of how to establish yourself in the team. Despite the injuries, Bielsa has again said that it is very unlikely that any new players will be signed in January – which is music to the ears of the players that are already there. The Argentine seems very, very confident with who he has got and that probably goes on the back of what he has seen this season. The question mark when he walked in was what could he do with this group of players that had been fair to middling? The answer has to be that he has elevated everybody across the board. He knows he has got players playing how he wants and with what he wants to do and he’s right in the sense that he had a long pre-season to be able to implement his ideas – which is always helpful. To bring people in mid-season wholesale and try and get ideas across while trying to win games, could be quite tough, so saying he is happy with what he has is a great reflection of how he feels about his squad and how far they have come. It’s not necessarily a case of us against them because Leeds are picking up a lot of admirers this season. But there is that galvanising effect of bunkering down and saying ‘look lads I trust you lot, what we have done so far is good but I want to make sure that we carry on’. That can breed the kind of loyalty that a manager such as Bielsa can create. It’s not only clever management upwards because you are not constantly asking the board for money but it’s also clever management through the players because they know they have got a decent crack at it. Also, in any kind of team structure, injuries play a part which do open doors for other players. This is their chance to show what they can do in and around the first team environment.